If you wake up some frigid winter morning to find a water pipe frozen solid, call us and we’ll send a trained professional to the rescue! We have professional pipe thawing machines that will quickly and safely thaw out that frozen pipe so that you can have water flowing again quickly! You may think your entire plumbing system is in perfect working order and there is little or no chance of a pipe bursting and flooding your house. There is one situation, however, you may not have considered. Water that freezes during the winter in an unprotected pipe expands, and that expansion can rupture an otherwise sound pipe. By taking the proper preventive steps, you may never need to worry about thawing frozen pipes, or worse, repairing a pipe that bursts when the water in it freezes solid. Make sure home has proper heating. For colder areas in your home (i.e. basement) consider a temporary space heater. For extremely cold temperatures, consider keeping faucets on with small drip trickle. Consider pipe insulation solutions. Call Plumbing 911 for options. While some may try a hair dryer, please do not try a propane torch. The risk of fire and unsoldering a joint are not worth the effort. Caution: Never use torch or other direct high heat on plastic pipe. 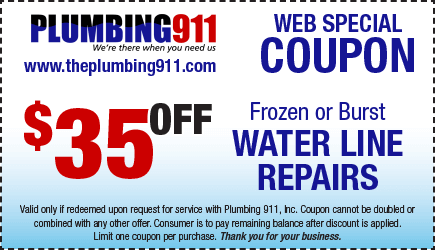 Drains, Water Heaters, Boilers and Sump Pump needs. We do it all! Just one call! Call Us Today – Emergency Service on Your Way!